The lion is known as king of the jungle, and he's engineered to rule. Not only does he have good senses -- he has great senses. His excellent sense of sight helps him see large prey, even at night, assisted by hearing and scent-detection. Tactile ability is part of communication with other lions. Cats are known for great vision and the lion is no different. If you share your home with a cat, you likely know he can see quite well at night. The lion also has excellent night vision, with eyes six times more sensitive to light than human eyes. His round pupil -- different from a house cat's vertical slit for a pupil -- allows more light into his eye, as does the white circle under his eye that reflects more light into his eye. 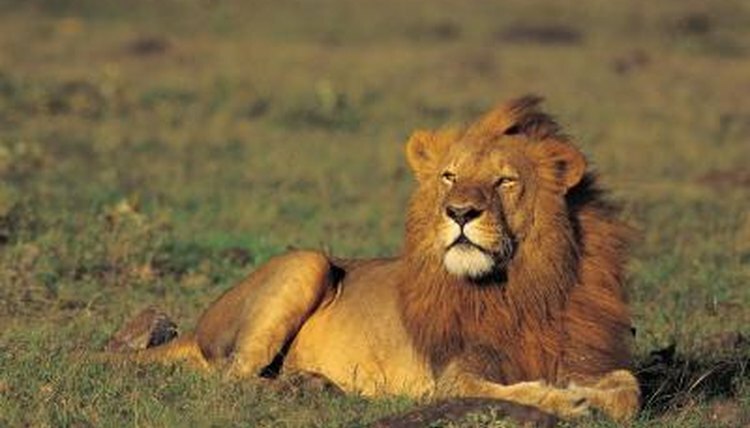 Compared to similar sized animals, the lion has larger eyes, as well as a second eyelid that helps protect his eye, as well as keep it clean. He can't move his eye side to side very well, but instead, has to rely on moving his entire head around to get a large field of vision. A well-developed sense of smell helps the lion in a variety of ways. Perhaps you've noticed your own cat make a sneering face when he's smelled something interesting. That's known as Flehman, and a lion will also grimace when a scent passes over the Jacobson's organ, a special organ on the roof of his mouth. This little extra helps a lion determine reproductive status, locate kills by other predators and find prey. A lion has good hearing, enhanced by movable ears that can adjust to the direction noise is coming from. As a result, he can hear prey at long distances -- up to a mile away -- as well as listen for his pride members. Though speech isn't a sense, a lion's roar is very important to him. One of only four cats to roar, the lion begins to roar around one year of age. A lion's roar is a method of communication, allowing him to serve notice about territory, speak to pride members and act as a show of aggression to other lions. As well, a female lion can discern the difference between a male's roar, allowing her to avoid males that may harm her cubs. A fully grown lion's roar can be heard almost five miles away. The sense of touch is important to the lion, allowing him to engage in a variety of peaceful behaviors, such as head rubbing with other lions in greeting and licking each other. Taste may not be important to a lion, but his tongue is covered in papillae -- small, backward-curving spines -- that help scrape meat from bones and assist in grooming. The lion's tail is still a bit of a mystery. The only cat with a tassel on the tail's tip, the presence of nerves and blood vessels suggests it may be a tactile organ.